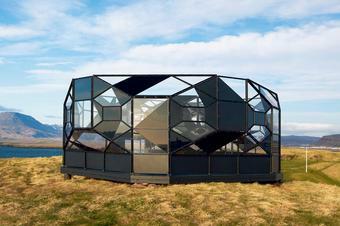 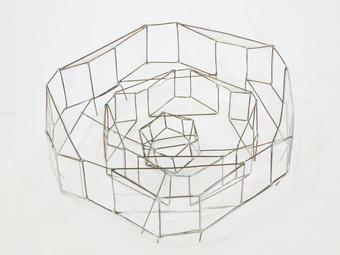 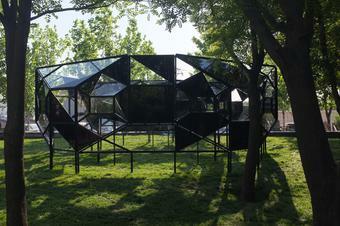 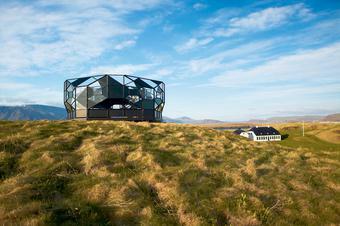 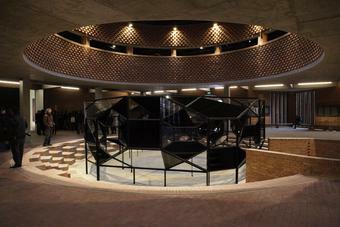 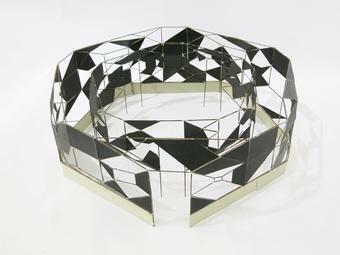 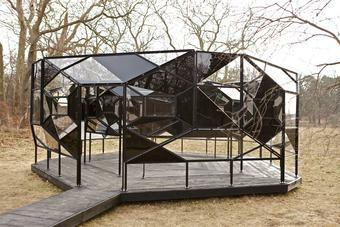 Two concentric steel framework structures, glazed with angular panes of clear and black glass, form The blind pavilion. 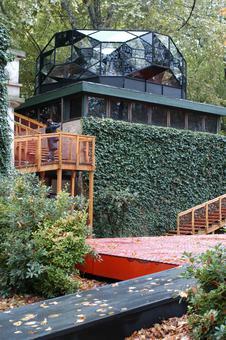 Situated outdoors on a wooden platform, the work is approached via a wooden walkway. 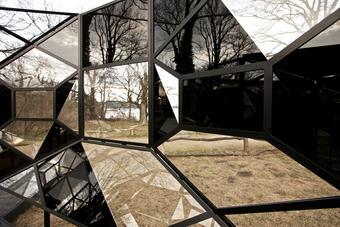 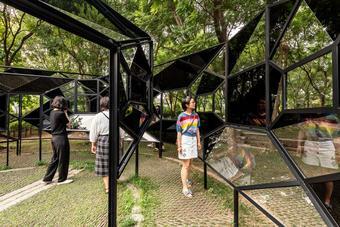 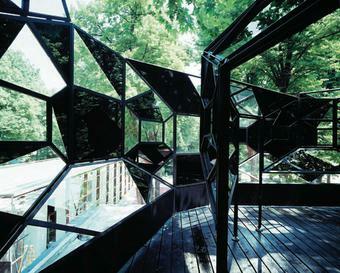 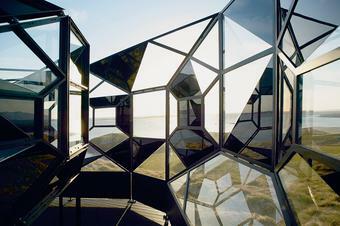 Moving between the pavilion’s inner and outer layers, visitors encounter ghostly echoes of themselves in the glass, while glimpses of the surrounding world are framed in the clear sections or reflected and partially obscured by the black glass. 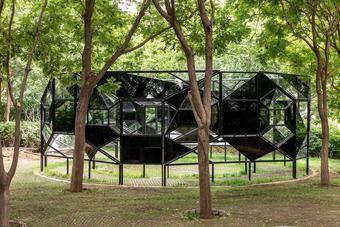 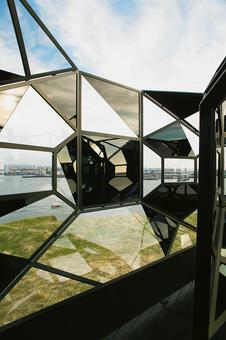 Although the pattern seems haphazard from the outside, at the very centre of the work the black glass panels line up so that the view out of the pavilion into the world beyond is obstructed. 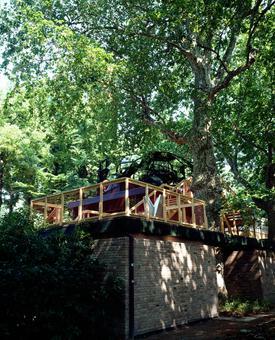 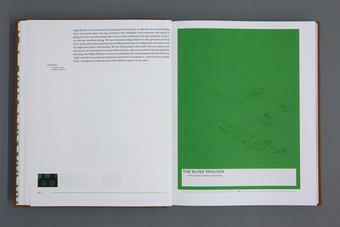 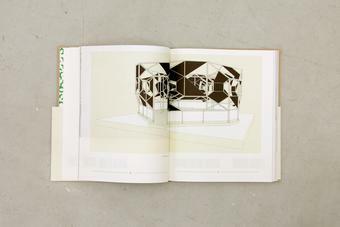 The blind pavilion was first exhibited on the roof of the Danish Pavilion at the 50th Venice Biennale, in 2003, where it formed an integral part of Eliasson’s overall pavilion concept, also titled The blind pavilion. The presentation in Venice focused on artworks dealing with various forms of looking in and looking out, and included another pavilion work, La situazione antispettiva. 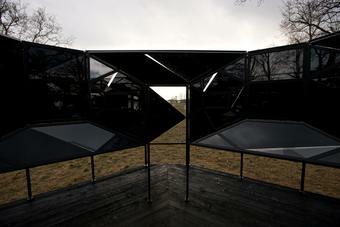 The blind pavilion was later exhibited on a hilltop on Videy Island, Iceland, and installed for the exhibition Innen Stadt Aussen (Inner city out), 2010, on the Pfaueninsel (Peacock Island), in Berlin.